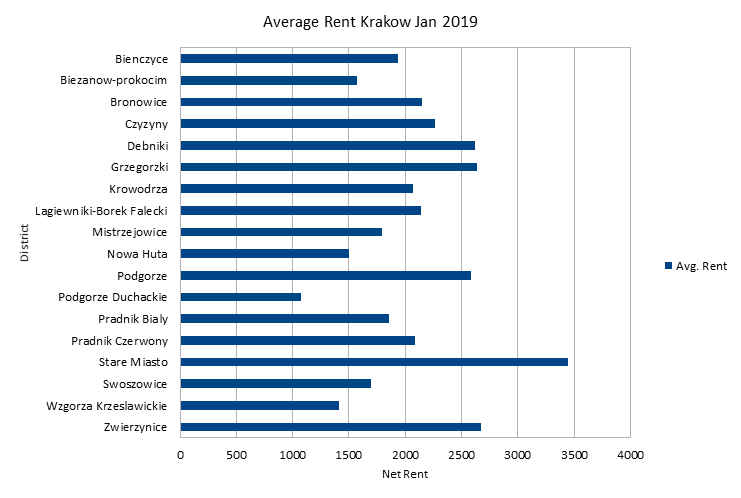 As part of a new series we at BigDoor24 are happy to kick things off with the Krakow - Average Rental Costs by District. Are you paying too much, too little ... or as Goldilocks would say ... just right! We start by looking at the average Rent per district in real terms. As you can see by the Graph below, rents in the city range from under zl. 1,500 to nearly zl. 3,500 depending on where you choose to lay your hat. Within the numbers, there is a disparity between apartments that have been newly built and those that are in older buildings and additionally these are what Landlords are asking, not necessarily what they are getting. To get a better view on value, the following graph is average rent per metre squared ( m2). QUICK NOTE - DID YOU KNOW THAT BIGDOOR24.PL NOW OFFERS PERSONAL REFERRAL CODES TO ALL OF OUR USERS? REFER US TO A SUCCESSFUL MORTGAGE APPLICANT AND GET A zl. 250 VOUCHER IN THANKS. REGISTER FOR MORE DETAILS. 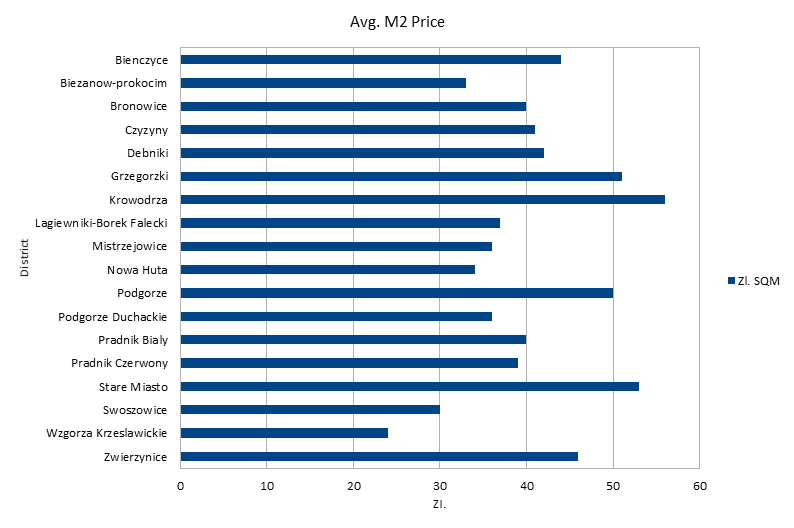 At first look, we can see that despite Stare Miasto being the most expensive in terms of total net rent, Krododrza is more expensive in terms of cost per apartment size. We would also add that in the less popular districts, particularly those further from the centre, there is limited offers and so the numbers should be used as a guide only. We would expect that there is better value than presented. Generally however, in relative terms, one district being cheaper than another, we believe our numbers are a good indication. Krakow has a much higher level of apartments available for rent versus apartments for sale, compared to similar cities. This can be due to a lot of apartments for sale, not yet built, duplicate adverts for the same property etc. but we still believe there is a good selection out there. - The Digest - every Sunday, the best stories from around the world about Poland. See previous examples here. You can hear an episode on Polish property on the recent KrakCast Podcast here. If any of the above interests you or you simply wish to support us Follow/Like & Share now. About BigDoor24.pl - A new free service that matches Expats with Professionals who speak their language. Receive zl. 200 for every zl. 100,000 borrowed through a BigDoor24 certified Credit Advisor.